The words of regular vistor E.B. White recall the joys of summer on Great Pond half a century ago, but speak just as truly of life on the Belgrade Lakes today. Now, as then, visitors find renewal in the tranquil lake at dawn, delight in children's laughter from the swimming dock, excitement in land and water sports, and wonder in the midnight calls of loons across the water. Here, the summer days still run in sync with the sun and end for us as they did so long ago for White, "Sleep would come easily and in the morning the red squirrel would be on the roof tapping out his gay routine." Glaciers carved these sparkling ponds into Maine's rugged granite 10,000 years ago. Through many ages, they were clear and beautiful, attracting wildlife and sustaining it beside their shores and in their limpid depths. A moment back, geologically speaking, mankind settled on the lake but only now we are beginning to learn just how fragile these seemingly eternal lakes can be. A sparkling, transparent lake can turn to muddy green in a surprisingly short time, or it can become choked with weeds that make swimming and boating unpleasant, or even impossible. We used to assume these lakes would always be here for us, but we know now we can no longer take them for granted. It's a good thing these lakes have been shielded by the visionary commitment of the sportsmen who founded the Belgrade Lakes Association (BLA) a century ago. Their pledge "to protect and improve the waters, fisheries and navigation of the Belgrade chain of ponds" lives on in the activities of Belgrade Lakes Association's members. The constant mission of the Belgrade Lakes Association, "To Protect and Preserve the health and beauty of Great and Long Ponds" is evident in the programs we support. 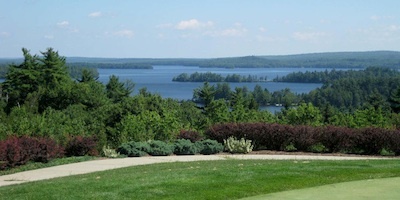 The Belgrade Lakes Association purchased The Mountain (225 acres) and works with the local land trust, the Belgrade Regional Conservation Alliance (BRCA), to secure other parcels of land, including an additional 50 acres on The Mountain in addition to the 7000 acre Kennebec Highlands. The Belgrade Lakes Association funds contribute to the support of a local youth Conservation Corps that works 2 months each summer throughout the Belgrade chain to eliminate erosion sites that would spoil the lakes if left untreated. The Belgrade Lakes Association promotes ongoing environmental education through publications, workshops, and outreach activities. The Belgrade Lakes Association has been a regional leader in the effort to keep invasive plants and animals out of our waters. The Belgrade Lakes Association supports and works closely with the Watershed Coordinator on environmental issues in the Belgrade watershed.